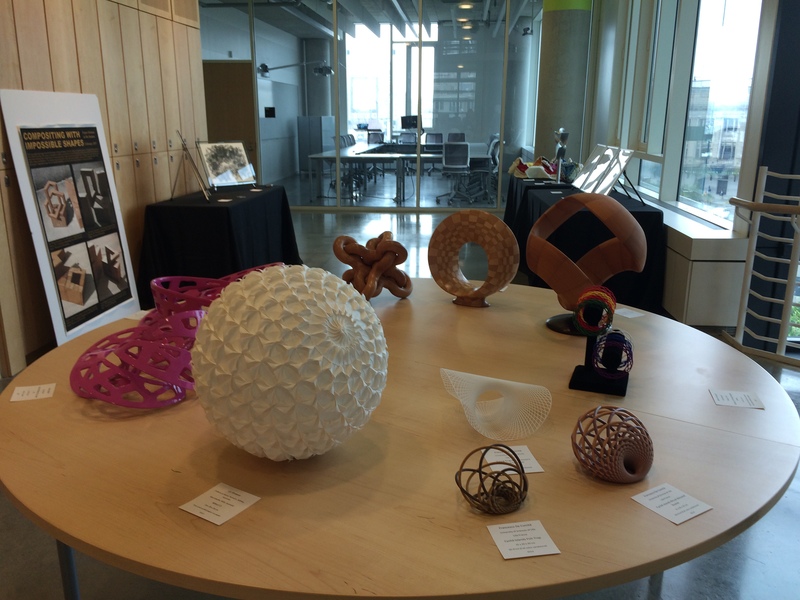 Every Summer the Bridges organization holds a conference devoted to Mathematics and the Arts. Bridges is an international organization whose sole mission is to foster and explore these interdisciplinary connections. This year the meeting was held in Baltimore Maryland in the beautiful University of Baltimore Law building. Each year the Art exhibition is one of the highlights of the gathering. 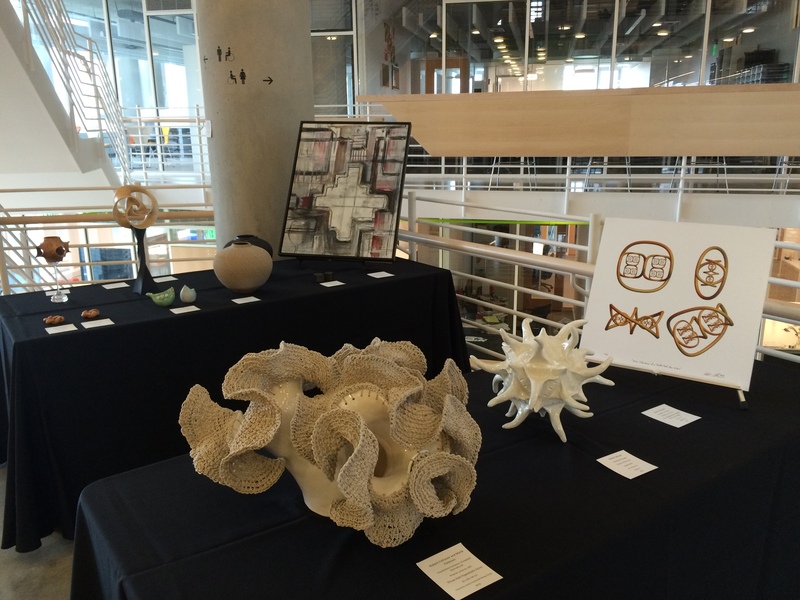 This year was a particularly impressive display of work in a light and open space over three floors. Here are two photos of the gallery. It has been very difficult for me to just single out a few art works to write about, for a complete overview I suggest checking out the Bridges website. Today I will focus on two works by two different artists that struck me particularly. I will start with a pencil drawings by Taneli Luotoniemi. I have a real affinity for hand drawing and I feel Luotoniemi is able to achieve a remarkable subtly of line form and grey scale using only a pencil. “The Hypercube” Is a 2-D representation of a 3-D depiction of a 4-D cube. There have been many example of two dimensional art referencing hyper cubes but this is definitely a a more organic representation then most. 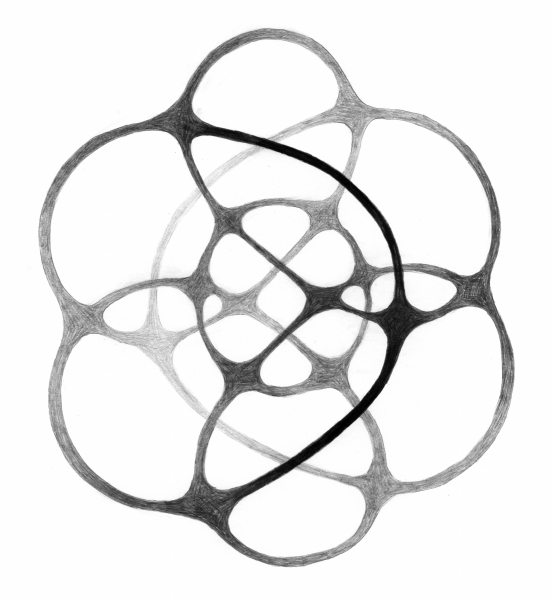 This is achieved by the use of thick curved lines that meet at crossings of more solid shapes, instead of small points. By adjusting the grey scale of the pencil mark Luotoniemi gives the lines the appearance of weaving over and under each other. This is one of the most graceful visual interpretations I have seen. 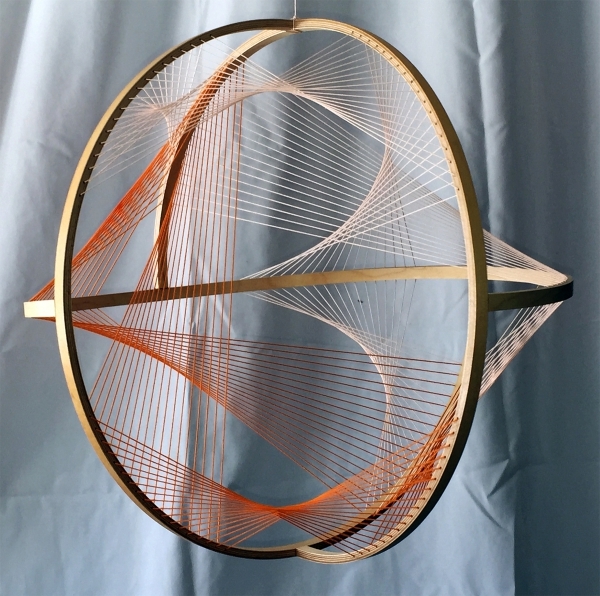 David H. Press builds elegant hanging sculptures that are a type of 3-D line drawings. The support structures are curved shapes but the wires within these frameworks are straight lines that form what appear to be curved surfaces. Symmetry plays a major role in Press’ work. In “Three Great ¾ Circles in Orange” the use of three circles would have created a sphere, but the ¾ circles create an asymmetrical frame work. Within the wire line work, however, there are some smaller areas with symmetrical properties. We are used to seeing complicated symmetries in Mathematical sculpture, but the use of the ¾ circles rips open the sphere, granting the viewer a fresh look. There were so much interesting work on display this year it is hard to discuss it all in one blog post, I will write more next week.